The Global Windows Azure Bootcamps is a set of locations globally where a bunch of community involved experts will give a full day of Windows Azure training for free. The date is April 27, 2013. The Global Windows Azure Bootcamps is a set of locations world wilde – or Globally – where a bunch of community involved experts will give a full day of Windows Azure training for free. The date is April 27, 2013 and the web site is here: Global Windows Azure Bootcamp. If you want to do a GWAB event your self on April 27 – do get in touch with us right away! It all started with an idea that doing events with my friends is more fun than doing them alone. I asked some buddies in the very active Windows Azure community if they thought this might be a good idea? Since they all did we drew up a few base-line rules for this event: We selected the date. We decided that each location takes full responsability (and organizers claims full credit for) their local event. Agenda, times, what kind of food, etc. is all up to the local organisers. We also picked a twitter tag for us: ”GlobalWindowsAzure” on Twitter. None of us had any clue this would happen when we envisioned a full day Windows Azure training event that was to be held at multiple locations on the same day. This is very much beyond anything we had hoped for. What am I on about? Well we have, at writing moment, something along the line of 30+ locations confirmed world-wide and a backlog of another 20+ locations which intend to committ to doing the event coming online soon. That means that potentially over 50 locations will do a shared free day of Windows Azure training on the same day. Does anyone know of any other community event of the same magnitude ever being executed before? We are on all continents including Antarctica. (That last location is sort of a joke but many like the location description for that location – and the event is organized by some MVPs – Most Valuable Penguins.) We are about to confirm a location for Kenya adding the first pin to the African continent. Brasil is going completely mad with something in the range of 15 events! 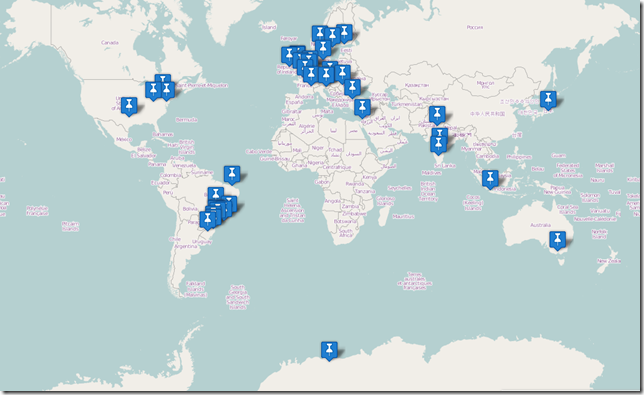 Pin-Map of GlobalWindowsAzure Bootcamp events per Feb 18th. As one of the tasks we will perform as part of the bootcamps. Each participant at each local event will do a deployment to Windows Azure of a set of worker instances which will all become part of a large render farm. The render farm will calculate graphics renderings as a BIG workload. Each location that has the capabilities can use an XBox controller to record new render jobs which will be added to the data queue. If we have 50+ locations and each location has about 30 participants which is able to deploy up to 20 instances each. Then this experiment will potential have tens of thousands of instances running"! How seriously cool is that? Note: Your company can also be part of sponsoring GWAB. Just get in touch with us through the web site and we’ll hook you up! We are very happy that several cool sponsoring companies such as the following sponsoring GWAB. The entire list is here Global Windows Azure Sponsors. This event could never have been done without the participation of a small army of globally distributed Microsoft and Windows Azure enthusiasts. In order to keep track of them all we have created an event for GWAB on Lanyrd: Global Windows Azure Lanyrd event. Maarten Balliauw for setting up our web site for the event. It runs in my Windows Azure account. Alan Smith for working on the very cool render farm shared windows azure workload. Mike Wood for working with our sponsors to add more cool SWAG to our event.